Celebrating the life of Leffie Hugh Fountain, Jr.
Be the first to share your favorite memory, photo or story of Leffie. This memorial page is dedicated for family, friends and future generations to celebrate the life of their loved one. 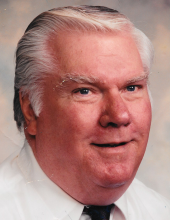 Obituary for Leffie Hugh Fountain, Jr.
Leffie Hugh Fountain Jr., went home to be with his Lord on July 18, 2018, after a brief illness. He was born on October 9, 1939, in Bay Saint Louis, MS. He was a retired Captain of the Pascagoula Police Department. He worked as a Criminal Investigator for the District Attorney’s office from 1989-1993. He was an avid Alabama football fan, had a lifelong love of planes, and while attending Pascagoula High School, he achieved his pilot license. He owned Fountain Seafood Company for many years, which he was well known for throughout the community. Leffie owned many shrimp boats. He was a good, generous man and helped a lot of people. He loved his lord and attended New Horizon Ministries in Moss Point. He is preceded in death by his parents, Leffie Hugh Fountain Sr., and Emily Hill Fountain; daughter, Sharon Lynn Benge; brother, Benny; and sisters, Catherine, Cecil, Rose Ella, and Eunice. He is survived by the love of his life of 57 years, Shirley Hawkins Fountain; daughters, Debbie (Danny) Dossett and Kimberly Reilly (Thomas); son-in-law, Billy Benge; sister, Linda McKay; brother-in-law, Herbert Hawkins and Emery Hawkins Jr. (Kathleen); and Papaw’s Hearts, Christopher, Jennifer, Jordan, Kody, Bradley, Victoria, Brendan, Emily, Madison, Adam, Peyton, Tommy, Kaylee, Tyler, Gavin, Matthew, Bella, and Emma. The visitation will be held at New Horizon Ministries 10501 Hwy 63 Moss Point, MS Saturday, July 21, 2018, from 12:00 p.m. until 1:00 p.m. The funeral service will follow at 1:00 p.m. with Rev. Don Edeker officiating. Heritage Funeral Home, locally owned and operated, in Escatawpa/Moss Point, MS is in charge of arrangements. To send flowers or a remembrance gift to the family of Leffie Hugh Fountain, Jr., please visit our Tribute Store. "Email Address" would like to share the life celebration of Leffie Hugh Fountain, Jr.. Click on the "link" to go to share a favorite memory or leave a condolence message for the family.